Begin by using fresh seed. If using leftover seed from the previous year, it should be tested for germination first. Place a specific number of seeds, such as 10 or 100 on a moistened paper towel. Fold the moistened paper over the seeds and put it in a plastic bag in a warm place. Take the paper out and inspect the seeds twice a day, spraying with water as needed to maintain moisture around the seeds. After the usual number of days required to germinate that variety, count to see how many have germinated and calculate the percentage of germination. Test the growing medium on site and at a soil test lab prior to seeding for pH and soluble salts. For optimum seed germination for most crops use a growing media with a pH of 5.7 to 6.2 and low soluble salts. Many seedling problems often relate to pH and soluble salts. To prevent damping-off, use a preventative biofungicide (protectant), either a commercial growing medium where it is already incorporated into the medium, or as a spray or drench. Damping-off is a disease of germinating seeds and young seedlings. Several fungi cause damping off including Rhizoctonia and Alternaria and the water molds Pythium and Phytophthora. Streptomycin lydicus (Actinovate SP), bacillus subtilis GB03 (Companion) and Trichoderma harzianum, strain T-22 (Rootshield), Trichoderma harzianum strain T-22, and Trichoderma virens strain G-41 (RootShield Plus+) can all be used for seedlings (including vegetable seedlings). Note: Actinovate SP, and RootShield are OMRI listed (organic). How a mix is handled can affect the air and water content of the mix. Air space results in good drainage and is important for healthy seedlings. Compacted media will reduce air space and lead to poor root development and difficulty with roots penetrating the media. To minimize compaction, containers, cell packs and plug trays should be lightly filled with growing medium and the excess brushed away. The medium should not be packed down, tamped down, or filled pots tapped down on the bench. The pots and trays should never be stacked directly over one another. Another consideration is the moisture content of the mix prior to filling containers. When water is added to dry components such as peat, they hydrate and swell. This swelling helps to create more aeration by preventing the particles from nesting within one another. This is especially important in plug production. Water should be added to the mix before it is placed into the container. It is best to moisten, then mix and allow to sit overnight prior to use. If that is not possible, waiting at least a couple of hours after adding the water will help the hydration process. The media should be damp to the touch but not wet. A simple test for moisture content of the medium is to take a handful after adding moisture and squeeze it. No drops of moisture should come out. When your hand is opened, the medium should still retain its shape. If it falls apart right away, it is too dry. When pressed lightly and it should fall apart. The correct amount of moisture will result in less shrink or settling of the media. Transplants can be grown in all types and sizes of containers. 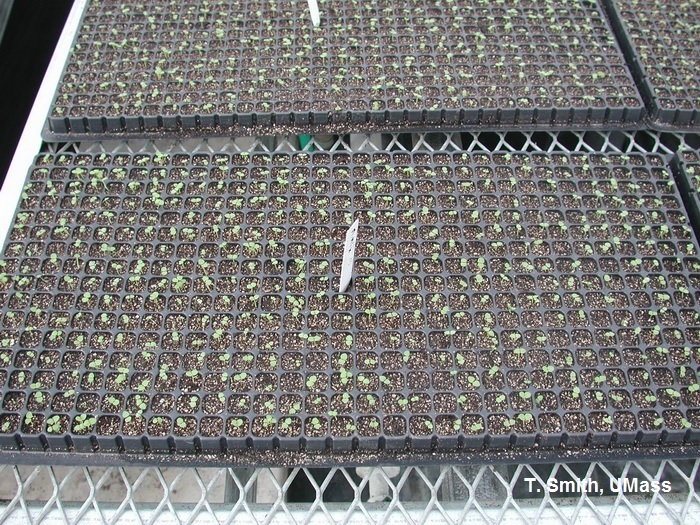 Seeds are sown in open seed flats or in single-cell (plug) trays. Before sowing, decide whether germination and finishing will occur in the same container or whether seeds will be sown in one container followed by transplanting to a finishing container. When sowing in open seed flats, growers often sow in rows. Seedlings are easier to handle and damping- off disease is easier to manage. However, if seed is sown too thick, crowded seedlings will result in stretched plants and create high humidity around seedlings that favor damping-off diseases not to mention the difficulty to transplant. Many growers use plug trays for some of their crops. Studies have shown that plug trays with deeper cells have better drainage and oxygen in the medium due to deeper columns. However, the importance of providing optimum temperature and moisture during germination is more critical than depth of the plug tray. If using plug trays, seed placement in the cell is important. Seeds placed near the edge of the cell are likely to desiccate. If covering seed, use medium or coarse vermiculite to create a micro-environment of high humidity. Fine vermiculite can result in buried seed. Some seed need light to germinate; these are covered lightly or left uncovered. A mist system will help keep these moist. Be sure plug flats are watered evenly and gently, especially for very small seed to avoid burying seed. Often the success or failure of plug germination is directly related to the moisture applied to the seed. Temperature and moisture requirements are determined by the crop being grown. Once the seeds have germinated, the growing medium can be allowed to partly dry between waterings. Move seed trays into a germination chamber or propagation area to receive necessary humidity and water as soon as possible after sowing. It helps to group crops by temperature needs. Do not allow germinating seeds to be interrupted by dryness by remaining in the seeding area too long. Warm temperatures and uniform moisture are needed to ensure successful germination and get the plants off to an even start, whether seeds are germinated on the bench or in germination chambers. Many germination chamber systems are commercially available including custom built germination units. Growers often use bottom heat or root zone heating to provide warm, even temperatures. Rubber tubing or mats with hot water are placed on the bench top under the plants. A weed mat barrier is placed on the top of the bench to help spread the heat with skirts on the side to help contain the heat. It is important to remove flats from the germination chamber as soon as radicles break through the seed coat to avoid seedling stretching. Experience and experimentation with your total seeding system is the key to uniformity and success. When using a germination chamber, it is important that the correct amount of moisture for germination is used until trays are taken out onto the bench. The choice of fertilizer will determine the type of plant growth as well as adjusting the media pH. Peat-lite fertilizers used for general crop production such as 20-10-20 will promote more shoot growth, softer plugs, fewer roots and result in a lower media pH. Most growers have found it better to use a special plug fertilizer such as 13-2-13 (high nitrate, low phosphorus plus minors) that will give more toned growth, better roots and maintain a higher media pH. Media EC levels should be monitored to avoid high soluble salts, which damages roots and promotes root rot. Beginning in Stage 2 (opening of the cotyledons) a dilute fertilizer program (25-50 ppm N) is normally started and the rate of application is gradually increased as the seedlings grow larger and approach transplanting with guidelines below. Rinse off fertilizer when applied on sunny days to avoid burning growing tips and tender young leaves. Crops sensitive to this problem include salvia, coleus, ageratum and snapdragons. Problem: Seedlings exhibit a corkscrew habit or lay down in the seedling tray or the radical hooks and grows along the soil surface without penetrating the surface. Possible causes: Compacted media in the cell or high soluble salts or high media pH. Problem: Upward cupping of leaves. Possible causes: Poor rooting and thickened roots indicate high soluble salts or growing too dry or sodium (perhaps high levels in irrigation water). An inward curl of leaves indicates excessive light for shade plants. Problem: Downward cupping of leaves. Possible causes: Overwatering or dysfunctional heater causing phytotoxicity and ethylene to be produced. Problem: Tip abortion combined with dark green foliage color. Possible causes: High soluble salts and/or high ammonium. Cox Douglas. Fertilizing Bedding Plant Seedlings. Damping Off, New England Greenhouse Update, 2014. 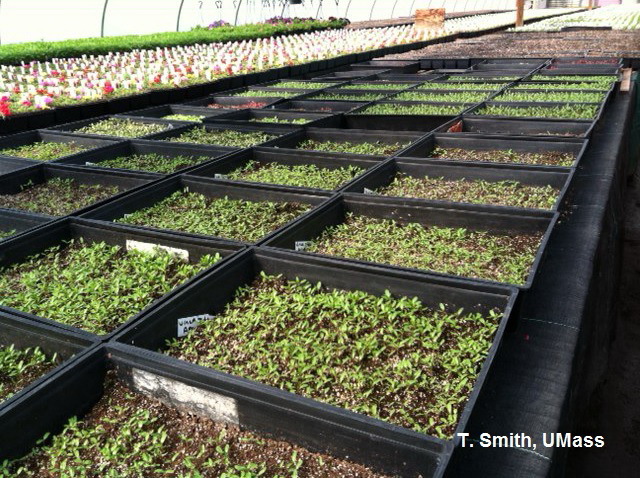 Smith T. Resources for Scheduling Greenhouse Crops. Sawaya Melhem. Growing in the Green: It’s time for a tune-up.